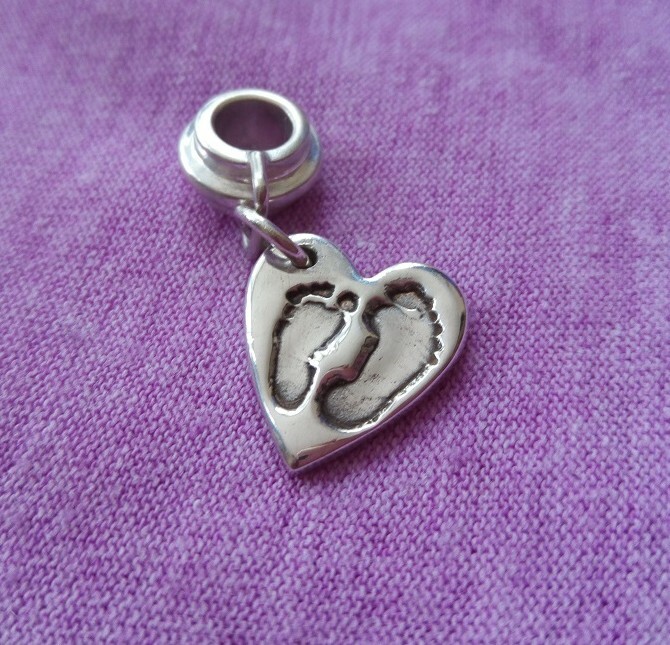 Our Fingerprint Jewellery is by far the most popular range of keepsake jewellery we create. Having a piece of jewellery with your loved ones fingerprint captures a memory forever. We can capture the fingerprints of those who are young and old, from toddlers to pensioners. Each piece is handmade to your requirements. We use Pure Silver to make our charms, this means that our jewellery can be worn by anyone as opposed to Sterling Silver which has mixed metals such as nickel, a common skin allergen, and is therefore not suitable for those skin reactions to such metals. If it’s a fingerprint necklace, a charm or bracelet, we can provide a unique piece of jewellery for you. You have the option to capture as many Fingerprints as you wish, there is a piece of jewellery to suit your needs. Bracelets can hold multiple prints as well as necklaces. A large charm can fit up to 2 prints. Our most popular Fingerprint keepsake for men are the Fingerprint Cufflinks. Adding the names of Daddy’s children, one on each Cufflink will make it a meaningful keepsake for him to treasure for years to come. Many of our customer opt for a 2 charm necklace or a 3 charmed necklace, depending on the number of children they have or the number of fingerprints they’d like to capture. We have have Charm Shape and Size Guide so that you can see what charm and size would suit your needs best. Our heart shaped fingerprint charms are the most popular shape chosen but we also provide other shapes such as circle, square, rectangle, star, bird and flower shapes for you to choose from. A small charm would be big enough to fit one print. This size charm is best for a bracelet. We can fit a name but it would have to contain no more than five letters. A name can be fitted on the reverse, this would incur an extra charge, so please contact us prior to ordering. 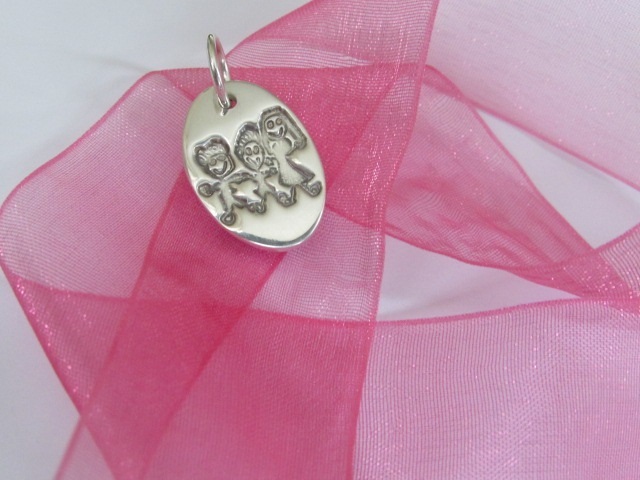 Medium size charms are best for chains necklaces and can fit one fingerprint and a name. If you’d like to capture two fingerprints onto one charm, we’d recommend a large charm. Two names can be added to the charm but this would depend on the size of each fingerprint. We can advise you with the style of your charm when you place an order or when you return the fingerprints back to us. Small sized charms fit perfectly on a bracelet. It could be an existing bracelet that you have such as popular charm bracelets like Pandora, Chamilia, Thomas Sabo and Links of London. attachments such as charm carriers and lobster clasps can be attached to your charm so that you can wear it on a bracelet you already own. How do I opt for the right attachment when ordering? Our most popular style of bracelet is the belcher bracelet. The standard size we provide is 18 inches. If you’d like a smaller/larger size, we could make one to order. Please contact us so that we can assist you with When you place an order, a free Fingerprint Kit will be sent to you. Read here to find out more about the process of taking your fingerprints. 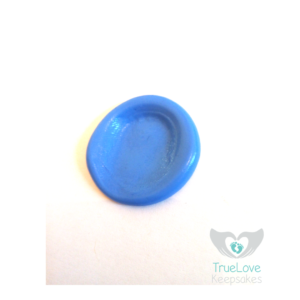 The kit includes full instructions and enough mould for you to take three Fingerprint moulds from each fingerprint you require. Click here to see a copy of the instructions we send out to you. We create Fingerprint Necklaces for men and women. A medium or large charm works best for necklaces and 18inces is the most popular length of necklaces for women. A 21inch chain is the most popular choice for men. We provide a snake chain or a Belcher chain for women and a Ball chain for men. Still unsure about what length of necklace to go for? Visit this site to view different necklace lengths on the neck to give you a better idea of the length you require. The descriptions for the Fingerprint necklaces in our shops show the necklaces we provide, if you’d like something different we have suppliers that can provide us with a range of alternatives to suit your needs. Please contact us and we’ll do our best to accommodate your requirements. Here are some of the answers to our Frequently Asked Questions concerning our Fingerprint Jewellery. Can I capture the fingerprint of a baby? You can capture the fingerprint of anyone of any age but we advise that if you’d like to capture the fingerprint of a baby, that you wait until they are at least a year old. This is because any younger than this, there will not be as much definition when compared to an order child or adult. You can still take the prints of a baby, just bear in mind that it will be a ‘dimple’ as opposed to a defined fingerprint. Nonetheless it will still be a precious keepsake to have. How do I return the prints back to you? You can return the prints back to me, using the pre-paid envelope I provide you with. Simply pop the prints in the envelope provided and post them back to me and I’ll notify you when I’ve received them. I’m not sure I’ve taken the prints correctly, are they good enough to use? When you can see a round, clear fingerprint on your mould, then yes these are fine to use. Look at the pictures below as an indication as to whether you need to re-do the prints. Sometimes mould is too flat (again look at the pictures below) which will make it difficult to ‘lift’ the prints to make an impression onto your chosen piece of jewellery. If you’re still unsure whether the prints are good enough to use, please send us a picture, via email at info@truelovekeepsakes.co.uk or send a message on our Facebook page. Can I re-do my prints if I’m not happy? Yes, we can send out another fingerprint kit to you. Additional fingerprints cost £5. We will enclose a pre-paid envelope for you to return the prints. How do I order an additional fingerprint kit? Fingerprint Kits can be ordered here. 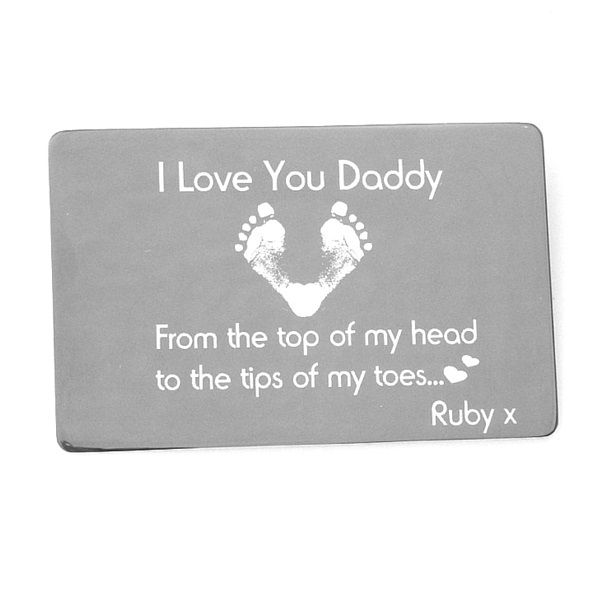 Alternatively, send us an email (info@truelovekeepsakes.co.uk) and we will process the order for you. I’m buying a Fingerprint Kit as I gift, what is included? If your buying as a gift, please select the option ‘Fingerprint Kit & Gift Box’ from the drop down box on our page here. You will receive full instructions, fingerprint mould, a free 10% off voucher for the recipient to use on their first purchase and a lovely presentation box, ready for gifting. Willl my jewellery be hallmarked? We follow the guidelines given by the London Essay Office (The Goldsmith’s Company) who state that precious metals under the weight of 7.78g will not need hallmarking.